It’s 2023 and Alice is a teenage girl out shopping to take her mind off her soon to be released exam results. Her smartphone beeps with a notification from her Pocket Mission Control app to say that there are just two hours before her personal spacecraft starts its run into the rings of Saturn. Rushing home, she goes to her computer to check on her fleet of personal spacecraft. She has a dozen at the moment, scattered all around the solar system. Some, such as her Neptune lunar explorer, are flying through space on their way to their ultimate destination - she really wants to be the first spacecraft to orbit the moon of Neptune that was discovered on her birthday in 2013! Others such as her Saturn and Mars spacecraft have already arrived and are working (or are about to) on their science missions. She was given her first spacecraft as a little girl by her uncle as part of the KickStarter PocketSpacecraft.com Mission to the Moon - the first interplanetary citizen space exploration mission. Her spacecraft are thin-film disks of printed electronics - smaller than a CD and thinner than a piece of paper with a computer, instruments and a design that she created printed on the surface. She had tracked the progress of her first spacecraft excitedly every day as it had taken a year to fly from earth to the moon. Once it entered low lunar orbit, it had sent back its radio astronomy observations before finally deorbitng to the surface of the moon. She had used the mission to get her Scout astronautics badge and taken her replica spacecraft to a school show-and-tell, and now her school has its own fleet of spacecraft exploring different corners of the solar system. She had shared the Pocket Mission Control app with the others in her troop and they often spent time around the campfire using its augmented reality feature to find their spacecraft in the starry skies. Her next spacecraft was a Mars lander, bought by her dad (at the last minute from an airport vending machine she suspected) for her birthday. A university had asked for help from a thousand people to each fly and land a personal spacecraft on Mars to look for earthquakes before a manned mission was sent, and she was excited to be part of such an important experiment. She’d received a copy of this spacecraft to keep and measure earthquakes at home too and it was interesting comparing the results from Earth and Mars. As a result of that mission she’d had her name published on a real scientific paper which had led to a summer job at a local university in a geology department. She had also enjoyed improving the software of her Mars lander in her spare time and was hoping to study aerospace engineering at university. The mail with her exam results arrived - she was going to be a rocket scientist! In the 70s the mainframe was the computer – large, expensive machines, tended in climate-controlled rooms by a priesthood of white coated technicians, carefully controlling access. Minicomputers gave more companies and universities access to computing in smaller, less fancy facilities, albeit for the price of a house. Then the microcomputer gave hobbyists and hackers the means to assemble and program their own computers in garages, bedrooms and home offices, writing and sharing software for fun, solving problems that couldn’t be solved any other way, and the computer revolution exploded. We want to do the same for interplanetary space exploration. Space agencies can send amazing multi-ton nuclear powered laser wielding robots hand assembled in clean rooms to another planet for about a billion dollars. In dozens of university laboratories around the world and a few small companies, small kilogram scale CubeSat spacecraft are hand assembled for missions in low earth orbit for a few tens or hundreds of thousands of dollars. PocketSpacecraft.com wants to give anyone the ability to design, build and operate their own milligram to gram scale interplanetary missions using just a web browser from their home, office or even the beach for the cost of a birthday present, which are then automatically built and sent out into the solar system. Milligram to gram scale? Surely you can’t do anything useful with such small spacecraft? Not so! The only reason our spacecraft are so light is that we have ruthlessly focussed on the economic issues that make space exploration so expensive and the key issue is launch cost and launch cost is driven by mass. We take the minimisation of mass to extremes. Instead of traditional chip packages that weigh 250mg, we extract and thin the bare silicon die until it is just 2.5mg – a 99% saving! We have designed a generic flexible architecture that allows us to mass produce mass customised hybrid thin-film spacecraft, landers and rovers on a continuum from a few square millimetres in area with a mass measured in milligrams, all the way through to a few square meters and grams. The size of the spacecraft are dictated by the type of mission – a probe designed to enter an atmosphere and land on a planet needs to be just big enough (typically a few centimetres diameter) to collect enough solar power to operate its instruments and send data to an orbiting high powered spacecraft to relay the data back to earth. The orbiting relay spacecraft needs a lot more solar power and a large aperture to focus the radio signal, so needs to be metres in diameter. We believe in building generic systems that perform multiple functions and use (and lose) mass intelligently. The cheapest format for obtaining a launch into space is the CubeSat, small spacecraft less than 5kg and 30cm x 10cm x 10cm. We pack our thin-film spacecraft into 3U CubeSats with modular and swappable propulsion systems for launch so we can obtain launches as cheaply as possible from multiple suppliers. Once in space, much of the mass and structure of a CubeSat that allows us to obtain the inexpensive launch is unnecessary, so we jettison it, leaving just the highly efficient thin-film devices to proceed with their mission. 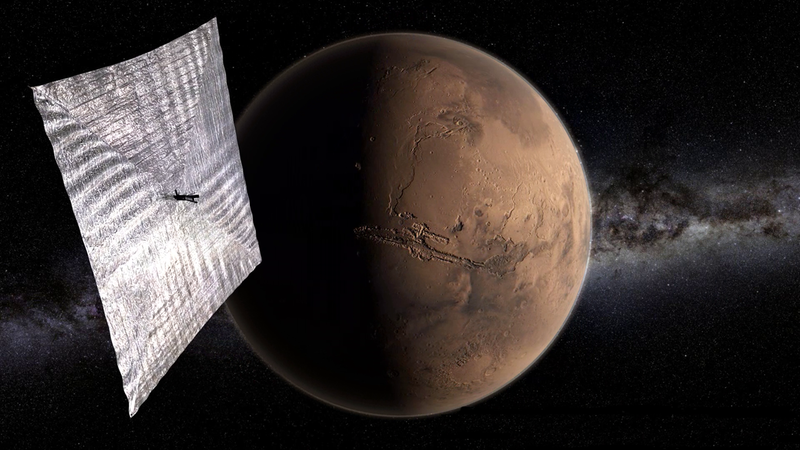 Our thin-film devices can act as solar sails, whether individually or bound together, propelled by just the force of the light of the sun through the solar system if they are light enough. When they reach their destination some can separate from the larger structure to act as smaller autonomous probes. By robotically building thousands of spacecraft using hybrid printed electronics, we eliminate the traditional hand assembly of one-off custom designs, allowing us to refine and automate processes and gain economies of scale. Through parametric design and automated manufacturing techniques, spacecraft are exactly the size and mass they need to be for the mission, whether that is a few square millimetres for an atmospheric probe or tens of square meters for a communications relay. This is radically different to the traditional way of doing things and may sound like science fiction, but it isn’t – have a look at these NASA reports for a review of the technology underpinning Interplanetary CubeSats and Printed Spacecraft. By opening spacecraft design and operation to the global community of engineers and hobbyists we hope to build an extensive open source open access library of tools and techniques that can be used by both citizen and professional missions and spacecraft designers. We hope that a global community will contribute to an ever-growing library of software, hardware and mission designs, sharing and reusing techniques, instruments, systems and more, and avoiding unnecessary reinvention of the wheel. Our goal is to provide generic tools for space exploration and science, accessible enough for non-technical and technical people to use, for fun or serious science. Some explorers will be professional scientists, many will not. We want people to be free to do whatever they want with their spacecraft, whether for fun or for serious science. We will provide science exchanges where scientists can propose science experiments they would like to do, provide the software and if necessary hardware designs to support these experiments as objects in the libraries that can be integrated with a simple tap or mouse click. Our production and communication systems will take care of the rest so that even if a spacecraft is being used for ‘fun’, it can take part in an underlying serious science experiment. One of the reasons we focus on printable technology is that we are working towards instant access to space. This won’t happen for a few years, but eventually we want to put the printers that will produce your spacecraft in space – we call these Prepositioned Orbiting Printers. For this mission we’ll refine some of the techniques for doing this on the ground, but we are already working on the systems necessary to allow you to design your spacecraft in your web browser, hit print, and have your spacecraft manufactured and pop out in space. Communications infrastructure is a complicated and important area that we have put a lot of effort into. We have a multi-layered architecture compatible with existing industry standards (such as CCSDS CFDP and Prox-1) where possible so that we can use (if permitted) existing communications infrastructure such as the Deep Space Network, and also be compatible with the amateur satellite service and spacecraft-to-spacecraft communications to allow low power spacecraft to relay data amongst themselves and onto bigger relays for the long haul home. So what might we do with these spacecraft? There are literally hundreds of ideas proposed every year, most of which are unable to be funded by space agencies, and thus are unable to proceed – we want to make as many of these missions possible as we can. For the last few years we’ve been bringing the Interplanetary CubeSat community together at workshops we created, and have co-led other workshops that have studied missions that can realistically be executed using these strategies. Our techniques allow CubeSat class missions to be implemented as thin-film devices, so if you see a CubeSat class mission described there is a good chance that it can be implemented as a thin-film spacecraft/lander/rover mission. Earth – measuring the neutral wind in the thermosphere. The Earth’s upper atmosphere is a very difficult place to study as it is too high for weather balloons (as they pop), and too low for traditional spacecraft (they burn up). Our thin-film Scout spacecraft however can flutter from orbit all the way to the ground and survive. By tracking their radio transmissions and integrating GPS receivers on board we can gain a very detailed picture of this region of our planet. Moon - lunar radio observatory. There are many interesting radio astronomy experiments which are too difficult to do on earth because of interference from radio emissions, from television to WiFi, from the power grid to cell phones. Placing a radio observatory in orbit around the moon that makes measurements when it is on the far side of the moon, where the moon shields the spacecraft from Earth’s radio emissions, would enable many novel experiments. Venus – mapping zonal wind flow. Venus is an incredibly hostile environment for spacecraft and landers due to high temperatures and pressures. The atmosphere is not well understood but holds the key to understanding its radical climate change. By flying disposable thin-film Scouts into the maelstrom, with a couple of larger motherships orbiting and tracking their descent and relaying their telemetry, we could gain a much better understanding of our twin planet. Mars – planetary seismology network. Planet-wide seismology networks have been proposed for Mars several times but they come with a very high price tag. Terrestrial networks using MEMS accelerometers in smartphones have demonstrated that this is a viable method of collecting this data. Landing thousands of thin-film spacecraft/lander/rovers around the planet would provide invaluable information for future robotic and human explorers of Mars. Saturn – studying its rings. Saturn’s rings are thought to be vast fields of ice particles moving at high speed through space. Sending a traditional single expensive spacecraft in to investigate and photograph these particles would be hugely risky. Deploying thousands of thin-film spacecraft that can be individually destroyed without compromising the entire mission could revolutionise our understanding of this complex system. We realise that this vision is big and bold, but it is also realistic and obtainable. We’re at the extreme end of the spectrum when it comes to accessibility, mass reduction and so forth, but we’re a professional group of scientists, engineers and designers who have been working with others to make these ideas a reality. This vision will happen one day; the benefits are too compelling for it not to. However the aerospace industry is very conservative and it may not happen for many decades unless a dedicated and motivated group of citizen explorers gets together to make it happen now. CubeSats allow us to try these ideas inexpensively and quickly - if you pledge to back this project today you can make this happen. Please spread the word to your friends, your family, and your social media contacts and help kick start the personal interplanetary space age by backing this project - today!